Caracas (Agenzia Fides) - "We invite all the people to participate in the Eucharist on Sunday 10 February, and to pray in all the churches, in our homes and communities, asking the Lord to grant us peace, reconciliation, freedom and spiritual and corporal health, and to creatively carry out gestures of fraternity and solidarity in the different communities". 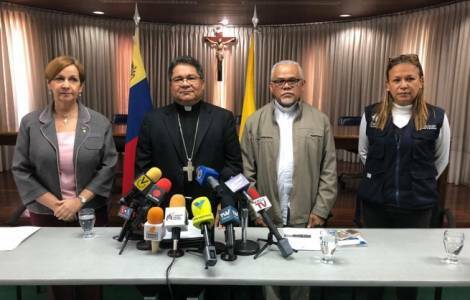 This is the appeal launched in a joint communiqué by the Presidency of the Venezuelan Episcopal Conference (CEV), the Conference of Religious (CONVER) and the National Council of the Laity (CNL). In all the communities and throughout the country we are experiencing "a dramatic situation", "we experience a painful situation of injustice and suffering due to the lack of what is necessary for a dignified and fruitful life", says the text, sent to Agenzia Fides. All this has led to the search for "political change through a peaceful and transparent transition process, leading to free and legitimate elections, in order to resume the democratic path and recover the rule of law, the reconstruction of the social fabric, economic production, morality in the country and the new meeting of all Venezuelans". This path towards the electoral process must be done "peacefully and with the instruments present in the national Constitution, to avoid greater suffering and pains to the population", is what is written in the text, which then judges "the increasing repression for political reasons, the violation of human rights and arbitrary and selective detentions morally unacceptable". Recalling the state authorities to "fulfill their first duty to serve the people" and to put an end to the abuses of power mentioned, in particular regarding the detention of minors, the signatories of the statement thank human rights activists for what they do despite the risks, and urge them to continue to assist victims who suffer injustice, asking for "respect and personal and legal security of those who exercise this worthy service in Venezuela". The Catholic Church urges the granting of the necessary permits, so as to alleviate the impact of the crisis on the most vulnerable people. Caritas Venezuela and the various institutions of social promotion of the Church are committed to continuing the wide-ranging service they lend throughout the national territory, "with fairness, inclusion, transparency and effectiveness". AMERICA/MEXICO - Mexican Bishops in solidarity with the Bishops of Venezuela "who denounce the deterioration of democratic life"